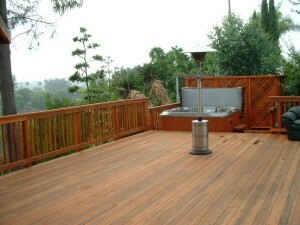 A beautiful, versatile wood deck can extend your lifestyle and add richness and pleasure to daily living. Equally as important, a deck is a long-term investment because it increases the resale value of your home. All decks succeed or fail for the same reasons—the quality or grade of the decking material and the maintenance of that material. High-end deck materials are dimensionally stable, resistant to shrinkage, and often inherently insect-repellent. Costs for these materials vary, so check on the availability of the product, whether extra shipping costs are required, and what long-term maintenance costs will be involved. Compare these figures to the costs of replacing a typical deck in ten years time and you’re likely to find that quality decking is worth the investment. Whatever your choice, a high-quality deck should be enjoyable for decades to come. High-end decking lumber is graded for appearance as well as strength, so when selecting quality woods such as redwood, mahogany, or ipe, look at the grade of the lumber. Heartwood, the tight-grained, slow-growth part of the tree, is rot-resistant and can last as long as three decades. Faster-growing, light-colored sapwood has less natural rot resistance and durability. Dense woods are more difficult to cut and frequently require predrilling, but the denser the wood, the better it will stand up to foot traffic and weather. 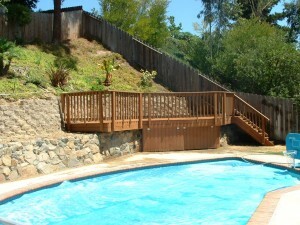 Granted, all wood deck surfaces should be treated every two years to promote graceful aging of the wood. All decks succeed or fail for the same reasons—the quality or grade of the decking material and the maintenance of that material. Composite deck materials are dimensionally stable, resistant to shrinkage, and inherently insect-repellant. Known by a number of brand names, most notably Trex and TimberTech, this durable blend of wood fibers and plastic weathers without disintegrating, maintains its shape, does not shrink or expand, and will last the lifetime of the residence. These plastic-wood composite products compare favorably with traditional pressure-treated wood decking and are environmental friendly. Composite decking weathers, like wood, but will age without deteriorating. It is dimensionally consistent, won’t splinter, has no knotholes, is completely rot-resistant, and requires no annual sealing. Composite decking lacks the strength of wood, however, and won’t span the same distances as wood. 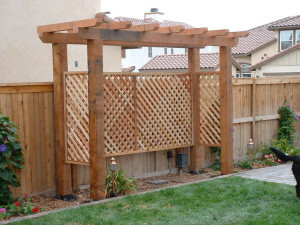 Plastic structural beams are not readily available in all markets and tend to make the deck bouncy, so pressure-treated wood is most commonly used to support this type of decking. 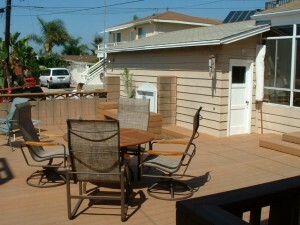 At San Diego Decks we construct all ground level deck frame’s using pressure treated lumber.